Do You Take My Dental Health Insurance? What is a tooth extraction and how will it benefit me? An extraction is a tooth removal. There are multiple reasons for tooth extractions such as gum infection, bone infection (systemic infection) and gross decay. The most common extractions that take place are wisdom teeth extractions. When we reach a certain age our wisdom teeth begin to erupt through the gums. For some people this may or may not be a difficult and painful time in our lives. It is typical for a person to experience pain with growth of a wisdom tooth. However, ignoring the pain will not solve the problem, it is a necessity to extract the tooth to reduce the chances of additional pressure to the sight and infection that may occur. At times there may be tooth extraction complications due to an impacted tooth (see image at right). An impacted tooth occurs when there is a lack of space in the bone structure of your mouth. This kind of tooth complication can also cause infection and will result in crowding of the teeth, making them slightly crooked. Now that you are well informed you still may be asking yourself “When should I have my tooth removed?” The wise decision for tooth extractions are simply when the tooth begins to be painful and irritating. It is important not to be scared of the slight pain you may endure, it is temporary and can be treated with the right tooth extraction care. Thanks to Dr. Sebastian and his oral surgeon associate, you will be in the gentle hands of trained professionals that have been practicing for over 20 years of experience. To make a tooth extraction appointment today please call our Huntington Beach office (714) 375-0959 and our staff will gladly help. Here you can see one of the reasons that a tooth would need to be extracted. 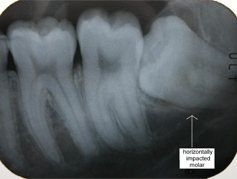 This x-ray shows a horizontal impacted wisdom tooth. This situation can cause a food trap on the back of the anterior molars leading to a cavity, crowding of the rest of the teeth, and pain. Call (714) 375-0959 to schedule your appointment today! Do you have Questions for Dr. Sebastian? Visit our Corona Dentist website!